STORYTIME FUN: For Preschool Children – Join us for children’s books, crafts, and activities from 1-2pm! No additional charge, cost included with admission or museum membership. Kids Fest: An event geared towards our younger visitors, this day is all about kids. Attendants will be able to play a variety of games, see varying acts (such as Des Coveries), and visit a variety of vendors from the tri-state. SURPRISE SPECIAL EVENT: We are working on something very exciting coming in October. Stay tuned for more information to come later in 2019! The Highlands Museums & Discovery Center has dozens of permanent and rotating exhibits to explore, with avenues of discovery to children and visitors of all ages. Interactive exhibits, educational experiences and innovative programs, both cultural and historical, celebrate our past, explore our present and enrich our future. 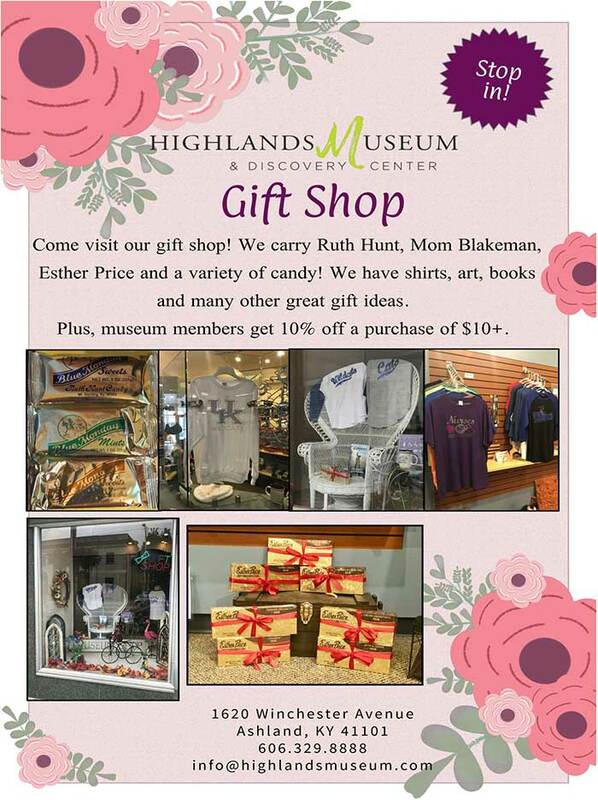 We carry Ruth Hunt, Mom Blakeman, Esther Price and a variety of candy! We have shirts, art, books, and many other great gift ideas. Plus, museum members get 10% off purchases of $10 or more. Click promotion above to expand. Highlands Museum & Discovery Center is a 501(c)(3) regional history and children’s museum in Ashland, KY.